When you are required to open an account to use or access the Site, Content, or Service, you must complete the registration process by providing the complete and accurate information requested on the registration form. You will also be asked to provide a user name and password. You are entirely responsible for maintaining the confidentiality of your password. You may not use the account, username, or password of someone else at any time. You agree to notify CalABA immediately on any unauthorized use of your account, user name, or password. CalABA shall not be liable for any loss that you incur as a result of someone else using your password, either with or without your knowledge. You may be held liable for any losses incurred by CalABA, its affiliates, officers, directors, employees, consultants, agents, and representatives due to someone else's use of your account or password. USE OF SOFTWARE. CalABA may make certain software available to you from the Site. If you download software from the Site, the software, including all files and images contained in or generated by the software, and accompanying data (collectively, "Software") are deemed to be licensed to you by CalABA, for your personal, or internal noncommercial, use only. CalABA does not transfer either the title or the intellectual property rights to the Software, and CalABA or its licensors retain full and complete title to the Software as well as all intellectual property rights therein. You may not sell, redistribute, or reproduce the Software, nor may you decompile, reverse-engineer, disassemble, or otherwise convert the Software to a human-perceivable form. All trademarks and logos are owned by CalABA or its licensors and you may not copy or use them in any manner. USER CONTENT. You grant CalABA a license to use any materials you post to the Site or Service. By posting, downloading, displaying, performing, transmitting, or otherwise distributing information or other content ("User Content") to the Site or Service, you are granting CalABA, its affiliates, officers, directors, employees, consultants, agents, and representatives a license to use User Content in connection with the operation of the Internet activities of CalABA its affiliates, officers, directors, employees, consultants, agents, and representatives, including without limitation, a right to copy, distribute, transmit, publicly display, publicly perform, reproduce, edit, translate, and reformat User Content. You will not be compensated for any User Content. You agree that CalABA may publish or otherwise disclose your name in connection with your User Content. By posting User Content on the Site or Service, you warrant and represent that you own the rights to the User Content or are otherwise authorized to post, distribute, display, perform, transmit, or otherwise distribute User Content. COMPLIANCE WITH INTELLECTUAL PROPERTY LAWS. When accessing the Site or using the Content or Service, you agree to obey the law and to respect the intellectual property rights of others. Your use of the Content, Service and Site is at all times governed by and subject to laws regarding copyright ownership and use of intellectual property. You agree not to upload, download, display, perform, transmit, or otherwise distribute any Content in violation of any third party's copyrights, trademarks, or other intellectual property or proprietary rights. You agree to abide by laws regarding copyright ownership and use of intellectual property, and you shall be solely responsible for any violations of any relevant laws and for any infringements of third party rights caused by any Content you provide or transmit, or that is provided or transmitted using your User ID. The burden of proving that any Content does not violate any laws or third party rights rests solely with you. NO WARRANTIES. CALABA HEREBY DISCLAIMS ALL WARRANTIES. CALABA IS MAKING THE SITE AVAILABLE "AS IS," AND "AS AVAILABLE." WITHOUT WARRANTY OF ANY KIND. YOU ASSUME THE RISK OF ANY AND ALL DAMAGE OR LOSS FROM USE OF, OR INABILITY TO USE, THE CONTENT, SERVICE, OR SITE, INCLUDING ANY HARM TO YOUR COMPUTER SYSTEM, LOSS OF DATA, OR OTHER HARM THAT RESULTS FROM YOUR ACCESS TO OR USE OF THE CONTENT, SERVICE, OR SITE, INCLUDING COMPUTER VIRUSES. TO THE MAXIMUM EXTENT PERMITTED BY LAW, CALABA EXPRESSLY DISCLAIMS ANY AND ALL WARRANTIES, EXPRESS OR IMPLIED, REGARDING THE CONTENT, SERVICE, OR SITE, INCLUDING, BUT NOT LIMITED TO, ANY IMPLIED WARRANTIES OF MERCHANTABILITY, FITNESS FOR A PARTICULAR PURPOSE, OR NONINFRINGEMENT. CALABA MAKES NO WARRANTY THAT: (A) THE CONTENT, SERVICE, OR SITE WILL MEET YOUR REQUIREMENTS; (B) THE CONTENT, SERVICE, OR SITE WILL BE AVAILABLE ON AN UNINTERRUPTED, TIMELY, SECURE OR ERROR-FREE BASIS; (C) THE RESULTS THAT MAY BE OBTAINED FROM THE USE OF THE CONTENT, SERVICE, OR SITE WILL BE ACCURATE OR RELIABLE; OR (D) THE QUALITY OF ANY CONTENT, SERVICE, OR OTHER MATERIALS PURCHASED OR OBTAINED BY OR THROUGH THE SITE OR IN RELIANCE ON THE MATERIALS WILL MEET YOUR EXPECTATIONS. NO ADVICE OR INFORMATION, WHETHER ORAL OR WRITTEN, OBTAINED FROM CALABA OR THROUGH THE CONTENT, SERVICE, OR SITE, WILL CREATE ANY WARRANTY NOT EXPRESSLY MADE HEREIN. LIMITED LIABILITY. CALABA'S LIABILITY TO YOU IS LIMITED. TO THE MAXIMUM EXTENT PERMITTED BY LAW, IN NO EVENT SHALL CALABA BE LIABLE FOR DAMAGES OF ANY KIND (INCLUDING, BUT NOT LIMITED TO, SPECIAL, INCIDENTAL, OR CONSEQUENTIAL DAMAGES, LOST PROFITS, OR LOST DATA, REGARDLESS OF THE FORESEEABILITY OF THOSE DAMAGES) ARISING OUT OF OR IN CONNECTION WITH YOUR USE OF THE SITE OR ANY CONTENT OR SERVICE PROVIDED TO YOU BY CALABA. THIS LIMITATION SHALL APPLY REGARDLESS OF WHETHER THE DAMAGES ARISE OUT OF BREACH OF CONTRACT, TORT, OR ANY OTHER LEGAL THEORY OR FORM OF ACTION. PROHIBITED USES. CalABA imposes certain restrictions on your permissible use of the Content, Service, and Site. You are prohibited from violating or attempting to violate any security features of the Service or Site, including, without limitation, (a) accessing content or data not intended for you, or logging onto a server or account that you are not authorized to access; (b) attempting to probe, scan, or test the vulnerability of the Service, the Site, or any associated system or network, or to breach security or authentication measures without proper authorization; (c) interfering or attempting to interfere with service to any user, host, or network, including, without limitation, by means of submitting a virus to the Site or Service, overloading, "flooding," "spamming," "mail bombing," or "crashing;" (d) using the Site or Service to send unsolicited e-mail, including, without limitation, promotions, or advertisements for products or services; (e) forging any TCP/IP packet header or any part of the header information in any e-mail or in any posting using the Service; or (f) attempting to modify, reverse-engineer, decompile, disassemble, or otherwise reduce or attempt to reduce to a human-perceivable form any of the source code used by CalABA in providing the Content, Service, or Site. Any violation of system or network security may subject you to civil and/or criminal liability. COPYRIGHT. 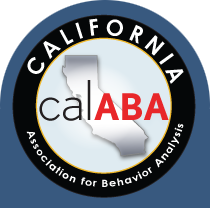 All contents of Site or Service are: Copyright © 2003 California Association for Behavior Analysis, 630 Quintana Road, #118, Morro Bay, California 93442. All rights reserved. Copyright is not claimed as to any part of an original work prepared by a U.S. or state government officer or employee as part of that person's official duties. NO LICENSE. Nothing contained on the Site or Service should be understood as granting you a license to use any of the trademarks, service marks, or logos owned by CalABA or by any third party. CALIFORNIA USE ONLY. The Site and Service is controlled and operated by CalABA from its offices in the State of California. CalABA makes no representation that any of the materials or the services to which you have been given access are available or appropriate for use in other locations. Your use of or access to the Content, Service, or Site should not be construed as CalABA's purposefully availing itself of the benefits or privilege of doing business in any state or jurisdiction other than California. FEES. Some products and services available through or in connection with this Site or Service require that you purchase a subscription or otherwise pay a fee. You hereby authorize CalABA and its merchant provider to charge your credit card in advance for all applicable fees incurred by you or on your behalf in connection with the product or service you have chosen to use. You are solely responsible for all charges, fees, duties, taxes, and assessments arising out of any use of your account by you or anyone else using your account. CalABA reserves the right to change the amount of, or basis for determining, any fees or charges for services it provides, and to institute new fees, charges, or terms effective upon prior notice to customers. Such new fees, charges, or terms shall not take effect earlier than 30 days after CalABA posts such modified fees on the Site or communicates them to you by e-mail. CalABA reserves the right to terminate any account at any time for any reason. CalABA agrees that it will terminate your account upon notice from you. If cancellation is received within the first 30 days of your signing up for a service, you will be refunded all subscription fees for that service, but you will still be obligated to pay any other charges incurred. If you cancel a service after 30 days of signing up for a service, no refund for unused time on such service will be made. If you have a balance due on any account, you agree that CalABA can charge these unpaid fees to your credit card. Your right to use the products or services available through any subscription plan in connection with this Site or Service is subject to any expenditure limits established by CalABA or by your credit card issuer. If payment cannot be charged to your credit card or your charge is returned for any reason, including chargeback, CalABA reserves the right to either suspend or terminate your access and account, thereby terminating this Agreement and all obligations of CalABA hereunder. If you have reason to believe that your account is no longer secure (for example, in the event of a loss, theft or unauthorized disclosure or use of your ID, password, or any credit, debit, or charge card number stored), notify CalABA of the problem to avoid possible liability for any unauthorized charges to your account. It is your responsibility to notify CalABA if your credit card has changed or has expired and to make appropriate changes or your service may be disconnected or interrupted.